Update: DejaOffice 1.11.7 is officially available in the Android Market. The latest beta of DejaOffice for Android brings a host of new features, interface improvements, and bug fixes. In this post, I’d like to highlight two of them. 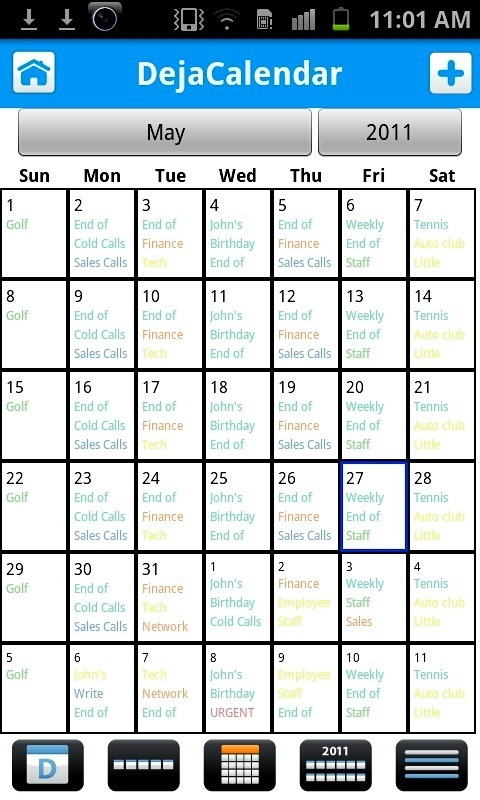 First, we’ve improved the calendar “Month View.” With a large amount of data in DejaCal, the month view could get fairly crowded and hard to read. By cleaning up the interface, we’ve made it much easier to view your agenda. For now, you’ll need to enable “Tablet Mode” to see this change. Second, due to popular request, we’ve added custom ringtone management to DejaContacts. Now, when creating or editing a contact, you’ll be able to assign a specific ringtone. You can also assign ringtones to categories, making it easy to determine if an incoming call is business or personal! Of course, for custom ringtones to work, you’ll need to be syncing DejaOffice with the native Android contacts. These are just two of many great new features and improvements in DejaOffice for Android 1.11.7 beta. Full release notes are available after the break, and you can download the latest beta today from www.dejaoffice.com/androidapp. This entry was posted in Announcements, Support Updates and tagged beta, dejacal, dejacontacts, dejaoffice, download, updates by David. Bookmark the permalink. First, I want to say I am so happy with this software and I truly appreciate what it offers me. I am grateful for a developer that listens to the people and implements changes based on feedback. However, I’m sorry to report I do not like the new month view. It is hard on my eyes; I have to strain to see the colored text and not all colors stand out enough in text only. The colored bars aided me in easily targeting what day to open. The text is small and frankly not useful at all. It’s the color that differentiates events for me on this view. Please bring back the bars; atleast an option to use them or not. Please!!! I would appreciate additional options for time intervals when creating events. Currently the options are 1 min, 5 min, etc., up to 15 min. This may be affective for an alarm but when creating events it would be nice to have 30 minutes and 1 hour as options. I discovered the following: from the month view in Deja Calendar, I hit settings and the TODAY icon. It should take me to today’s view but it does not. It does nothing-I remain on the month view. In addition I have the same experience with GO TO DATE. I select a date and the view remains on the month view; nothing happens. First off, thanks for the feedback! You make some good points here and I am forwarding these comments to our dev team to look into for future updates. Comments like yours are what help us to make our software even better and we love hearing your ideas! To address one specific comment – a temporary solution for the month view calendar is to change the Font Size to “Delightful Size” vs “Tablet Mode”. To do so, open DejaCalendar and tap the title bar. There will be an option that lets you adjust the Font Size there. Be sure to choose “No” when it asks to change the display size for the view/edit screens as well. Finally, if you haven’t already, I’d encourage you to visit the DejaOffice forums to share your thoughts there as well. That way other users can offer their feedback on your suggestions as well! Head over to http://www.dejaoffice.com/forums/forum.php to get started. Thanks so much for a prompt response! I REALLY appreciate that. I did what you suggested for the month view so I could hone in on the colors better. I’ve used delightful size in the past but I prefer the tablet mode. 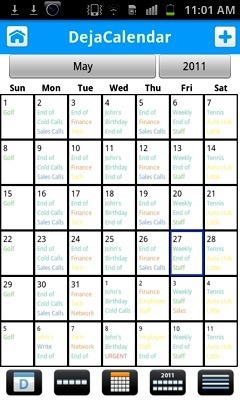 I like the full screen calendar and the ability to show more than one event on each day. I’ll post my feedback on the forum; thanks for the suggestion and for sending these requests on to the development team. Thanks so much. I am attempting to download it now; the web page was unavailable so I’ll try again. A beta release is simply the step before a full release. We’ve added new features, tested them internally, and are releasing the update as an optional beta that users can install. Users who install the beta gain access to the new features before the full release, but they may encounter bugs that we did not find in our own testing. If this is the case, we go back and fix the bugs before releasing a full release of the next version. Hopefully that makes sense! It sure does! Thanks for explaining it to me David. I downloaded the beta version and the display is brighter and I can get used to not having color bars. Great! I noticed that the TODAY and GO TO DATE icons from the settings menu still do not work. Pls make today more visible. Blue frame for today is too few to have it visible at a glimpse. A valid point – I’ll pass this along to our developers!